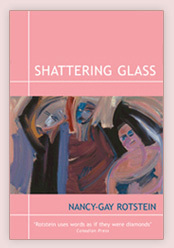 Nancy-Gay Rotstein’s poetry has been hailed for its powerful imagery, perceptive insights and universal appeal. Her most recent collection, THIS HORIZON AND BEYOND: Poems Selected and New — which has been published in the United States, Canada, Australia and the United Kingdom — presents a poetically crafted tapestry that pays homage to the joy of life itself. THIS HORIZON AND BEYOND brings together landmark poems of Rotstein’s previous collections -- THROUGH THE EYES OF A WOMAN (1975), TAKING OFF (1979), and CHINA: SHOCKWAVES (1987) -- with those appearing in print for the first time. Included in this volume are poems from her travels through China as one of the early Westerners to enter that country after the Cultural Revolution (Watch video: Interview from China) as well as those poems capturing the stages in a family’s life written over a twenty-five year period and purposely held for publication as a unit. This collection, arranged into sections titled Sightings; Compass Points: Eastward, The Equinox, Borders; and The Cycle, provides a probing look in verse at “this horizon and beyond.” Rotstein captures an awareness of time, of history, and of a sensibility beyond the surface of what she is describing. There are poems that are celebratory of life and light-hearted in spirit alongside those which are haunting in depth and meaning. With intensity and passion, she paints indelible scenes of her homeland of Canada, its vast landscape and seasonal beauty, and addresses as well its challenges and concerns. We are at her side in countries such as Greece, Italy, Japan, Israel and the Caribbean, where, with poetry in place of a camera, she captures in print vivid poetic “snapshots,” all with stirring reality and impact, intertwined with her own emotional reactions to the view she so eloquently describes. She juxtaposes poems describing unspoiled nature with those portraying its destruction though mankind’s constant -- and often unintentional and careless -- acts to both land and water, and she reflects on the ecological legacy we leave those who follow. Throughout the collection are her colourful, insightful poem portraits of people, from beloved family members such as “NANA” to poems like “THE VISITOR”, which, as Layton points out: “explode with delicious irony and nuanced meanings.” He praises as well “her gift to see into the core of people and events,” as in “POWER”, where she writes about “sophisticates of illusion / they have captured our world / and hold us all to ransom”. “I know of no more disturbing and pertinent remark about the contemporary world than what I find in these three expressive lines,” comments Layton. In bringing together some of Nancy-Gay Rotstein’s finest work to date, THIS HORIZON AND BEYOND is a celebration of the craftsmanship, poetic vision, and humanity of a unique, dynamic voice.